The Chester Yacht Club is located on Mahone Bay which is along the south shore of Nova Scotia, Canada. The Bay is dotted with many Islands (some say one for every day of the year) which makes for beautiful sailing and boating of all kinds. Chester has a long history of yacht racing. Today the highlight of the racing season is Race Week. Taking place in August it is hailed as the largest fixed keel regatta in Canada. Racing now takes place in front of the CYC Club House. 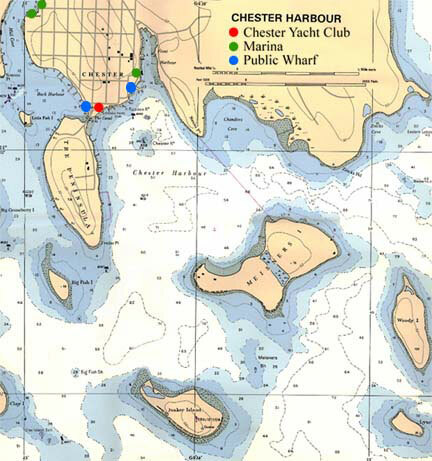 This section from a Chart shows Chester Harbour and the location of CYC.